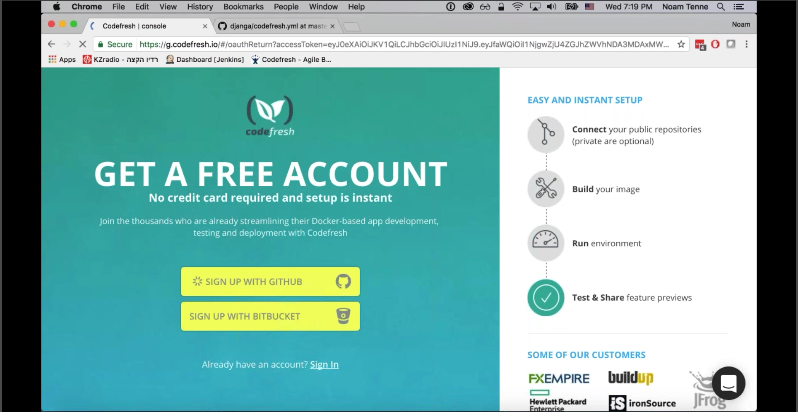 Thanks to everyone who joined us during our webinar “Intro to Codefresh YAML.” During this webinar, Noam Tenne (Codefresh Senior Backend Engineer), explained how to work with YAML files and customize your build environment /pipeline. The recording of the webinar is available to watch on YouTube or below. Easy Extensibility– YAML provides a format that is easily extensible so we can quickly add new features and adapt to the changing ecosystem. User Flexibility– We want you as the user to have maximum power because we might be using very similar systems or build tools, but we do not all have the exact same use case. So there isn’t one tool or configuration that can fit all. YAML’s format allows for maximum power, configuration, and customization. Portability– Ideally we want our configuration to be portable. 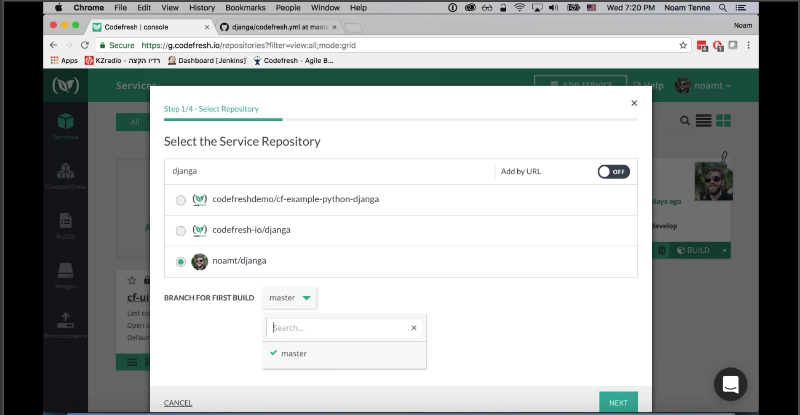 While it’s very easy to quickly configure a service using the Codefresh UI, you can’t take it anywhere else. Having a YAML file means that given a command line tool, you can reuse this YAML file anywhere you build. So if you have a repository containing the Codefresh YAML file, no matter where the build engine runs, you’ll be able to reuse the same format and tools. Accessibility– YAML represents an abstraction over very complex configurations. Its purpose is to make life as easy as possible for you the user. What is the Codefresh YAML file? It’s a domain-specific language (DSL) based on the YAML format. Similar to other tools it’s placed within your SCM repository. It’s an abstraction of the complex configuration that you have. There are different step types for every sort of task in your workflow- Git Clone, Docker Build, Docker Push, Docker Compose, Launch, and Freestyle. Using the git-clone step, you can work on multiple repositories within the same pipeline. This means you can clone multiple repositories and build multiple images in one build process. You can also add post-step hooks to specify what you want Codefresh to do before and after each step completes successfully or fails. A step might be multiple containers (composition). Steps may be executed on different machines, cloud, on-prem, or a pool of servers (can run anywhere since it’s portable). 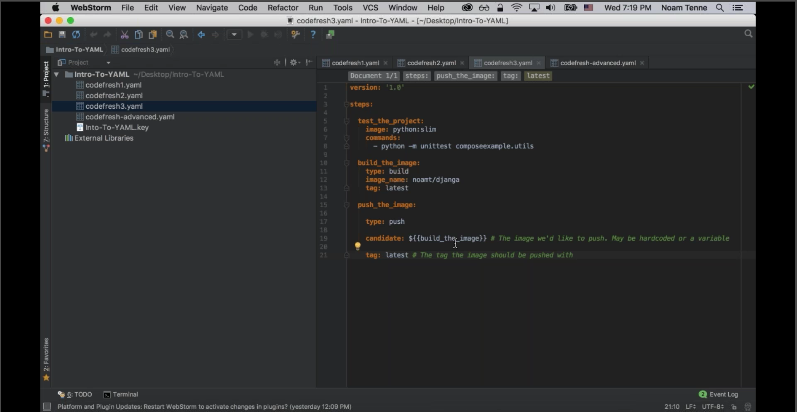 Noam kicks off the demo by showing how to build a very simple YAML file. He demonstrates how to run basic tests on your code, specify the image, and declare steps for any command you want to execute. 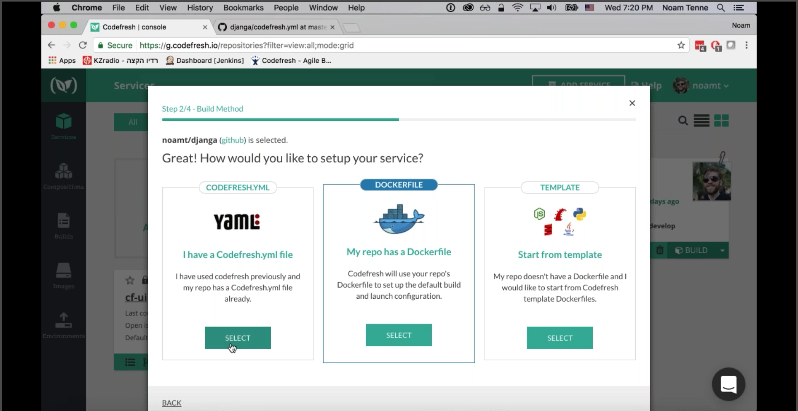 Once the image is specified, Codefresh builds the Docker image and you can automatically push to Docker Hub or any registry upon success. 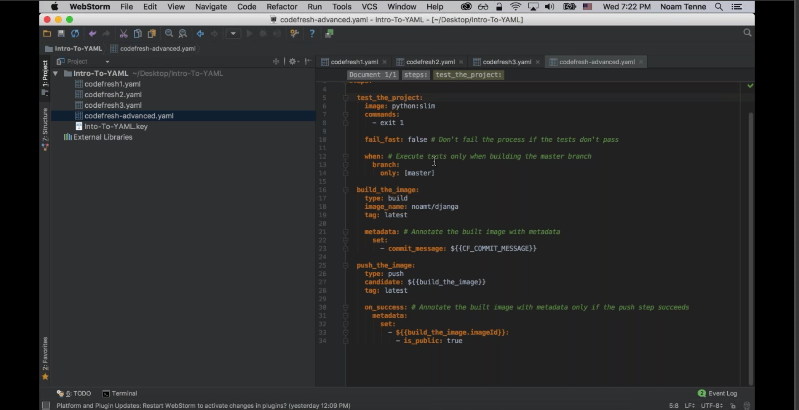 After showing how to write the YAML file, Noam explains how to execute it in Codefresh by adding a service with your YAML file. 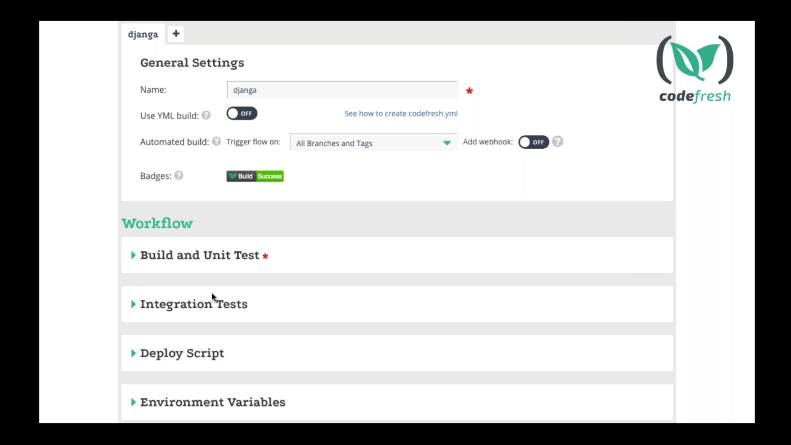 Step 4 – Review the path to your YAML file and click create to start building. A plug called Failed Fast- This allow us to mark a step as non-mandatory so if fails the build will continue to execute. Conditional execution – select to optionally execute different steps based on different branches or variables (Ex- only run when it’s a master branch). Join the conversation on Slack- Email us at contact@codefresh.io and we’ll add you to Slack so you can ask Noam and our team any questions about the Codefresh YAML or Docker-Native CI/CD. I enjoyed my first encounter with codefresh – listening to the “Intro to Codefresh YAML”. Just about everything was perfect – with one exception: the recording is made with a very low resolution, so there is no chance to view it in full screen mode (yes, I do have dual 4K monitors, but this should not be a rare occasion these days). Can you consider making a better recordings, please?